What Is a Bruja or Brujo in Witchcraft? You may occasionally hear the word bruja or brujo used in discussions about magic and witchcraft. These words are Spanish in origin and are used in many Spanish-speaking cultures in Latin American and the Caribbean to refer to people who are practitioners of witchcraft. Bruja, with the 'a' at the end, is the female variation, while a brujo is male. Typically, the word bruja or brujo is used to apply to someone practicing low magic, or even sorcery, within a cultural context. 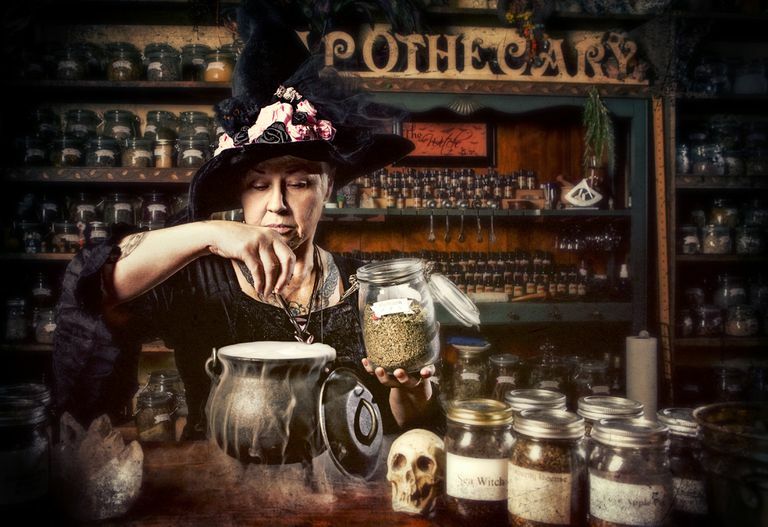 In other words, a contemporary practitioner of Wicca or other Neopagan religion might not be considered a ​bruja, but the wise woman on the edge of town who offers hexes and charms may be one. In general, it’s considered a negative term, rather than a flattering one. The practice of Brujeria, which is a form of folk magic, usually involves charms, love spells, curses, hexes, and divination. Many practices are rooted in a syncretic blend of folklore, traditional herbalism, and Catholicism. Brujas are known for practicing both dark and light magic. Thus, for example, if a child or animal disappears, a bruja is often suspected of spiriting them away. As a result, parents in some areas keep the windows shut at night for fear of brujas. At the same time, however, if a mainstream medical cure cannot be found for an illness, a bruja may be consulted. In addition, some traditions hold that brujas can change their shape, inflict curses through the "evil eye," and otherwise use their powers for good or evil. In music, nightlife, visual arts and more, we’ve seen a rise in self-identified brujas; young Latinxs seeking to reclaim a cultural taboo and flip it into a means of empowerment, to proudly represent the parts of their heritage that have been cut out of patriarchal or Eurocentric narratives. In addition to referencing Brujaria through the arts, quite a few younger people are exploring the history, rites, and magic of Brujaria. Some are becoming practicing brujas, and it is relatively easy to find lessons or to hire a bruja, particularly in Latino communities. Practitioners of Santeria have much in common with brujas and brujos. Santeria is a religion of the Caribbean developed by people of West African descent. Santeria, meaning 'worship of the saints,' has close connections to Catholicism and Yoruba traditions. Practitioners of Santeria may also develop some of the same skills and powers of brujas and brujos; specifically, some practitioners of Santeria are also healers who use a combination of herbs, spells, and communication with the spirit world.